I'll admit it - I've never really been that big on hand cream. I know to some people, it's their complete Holy Grail, wouldn't-be-without product, but to me it just seemed a bit of an inconvenience. However, after suffering with dry hands on and off over the years, it has become much more of a staple in my routine. Particularly since I was complimented on my hands the other day, and even told I could be a hand model (go me), I've been trying to make a bit more of an effort to look after them. Afterall, it is said that a big sign of how old you are is shown in your hands, so I'm all about keeping mine in tip-top condition. I thought after goodness knows how many years of beauty blogging, it was about time I shared my ultimate favourite hand creams with you. There are six hand creams that I believe deserve an accolade, and all of which I use on rotation as I love them all so much. 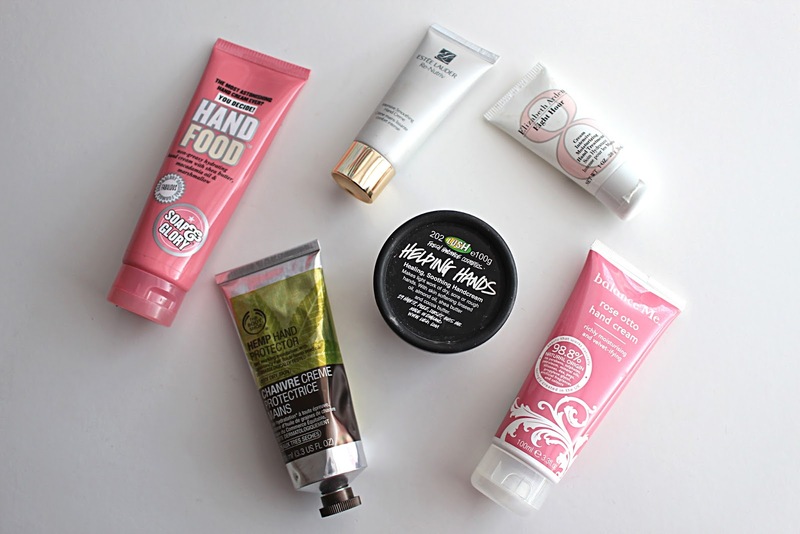 I'll start with Hand Food, the pretty-in-pink hand cream from the one and only Soap & Glory. Like all of Soap & Glory's fabulous products, this one smells like an absolute dream and most definitely scores points in the moisturising department. It's a lovely non-greasy formulation that is rich in hand-pampering ingredients, such as shea butter and macademia oil, and is a definite handbag favourite of mine. It's a steal at a fiver for 125ml too. Next up, the slightly less pretty-looking hand cream from The Body Shop, in the form of their Hemp Hand Protector. Now, The Body Shop have a big array of different hand creams, but if you're in need of a serious hand pick-me-up, then the Hemp one is for you. It contains hemp seed oil which moisturises deep down and provides serious protection from all the nasty elements that take their toll on our hands. I like to use this one when my hands are feeling on the really dry side, as it is specifically for very dry skin. It's not as cheap as Hand Food, coming in at £10 for 100ml, but it's definitely worth it if you need some serious moisturisation. The most priciest, and indeed luxurious of the bunch, has got to be Estee Lauder's Re-Nutriv Intensive Smoothing Hand Creme*. This hand cream is perfect if you want a taste of luxe from your hand cream, as well as being ideal for those of us who are concerned with anti-ageing. As well as being seriously moisturising and hydrating, smelling gorgeous and keep our hands feeling smooth and soft, this hand cream also contains an advanced anti-spot technology which helps reduce the look of dark spots and even out skintone. A must-have if you fancy splurging on a hand cream, as it comes in at a slightly eye-watering £54. 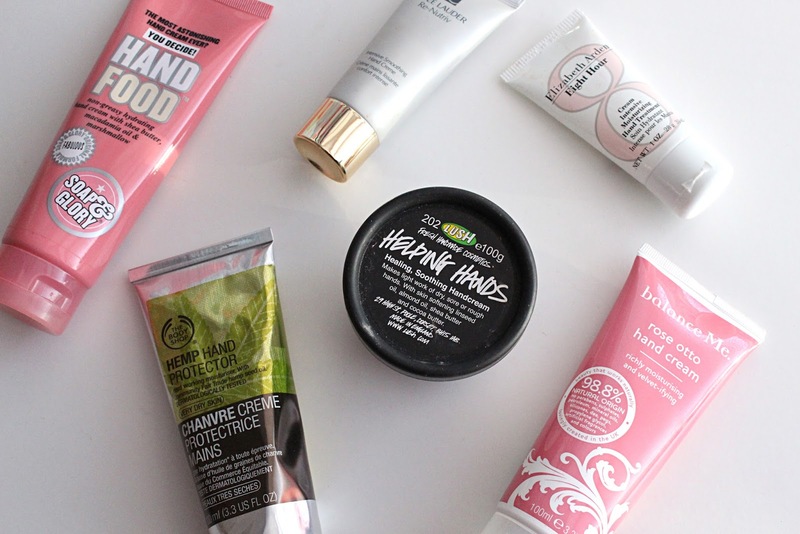 Getting back to more reasonably-priced hand creams, Lush comes to the rescue with their amazing Helping Hands. I bought this a while ago when I was suffering from really dry hands and was in desperate need of a hand cream that would solve my problems. I've always been intrigued by Lush's selection of hand and body creams, and this one doesn't disappoint. I was drawn to it as the website states that it was originally created with nurses in mind, who often suffer with very dry, cracked hands. This was perfect for me as at the time the skin on my hands was in serious need of some TLC. I really recommend this hand cream if you suffer with dry skin on your hands as it contains skin softening ingredients such as linseed oil, almond oil, shea butter and cocoa butter. The smell might not be to everyone's taste, but it's great for really dry skin. It's £7.50 for 100ml. Finally, the last in my selection of favourite hand creams has got to be the amazing Rose Otto Hand Cream* from Balance Me. This award-winning hand cream smells delicious, is 98.8% natural and is fantastic at leaving your skin feeling velvety smooth. Rich in antioxidants and oils, it deeply hydrates, plumps and moisturises skin. My favourite thing about this hand cream is the smell, however - if you like rose scents, this will be a dream come true. Slightly pricier than some of the other creams mentioned, Balance Me's offering comes in at £14.50 for 100ml. Totally worth it for the amazing smell though!